What 'click stops' does the RD5 have? A Nodal Ninja ' CNC machined' advanced rotator. 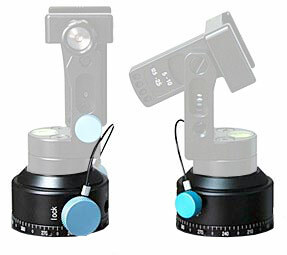 These rotators combine high precision, ease of use, compactness, light weight and durability. The inner ball bearing construction also provides for very fluid rotation. You can now change click stops on-the-fly, ideal in time sensitive situations in which shooting must be completed quickly, such as in shooting high resolution multi-image mosaics or shooting the same scene at different focal lengths. The RD5 has 5 different selectable click options suitable for wide angle and standard focal length (approx. 50mm) shooting. 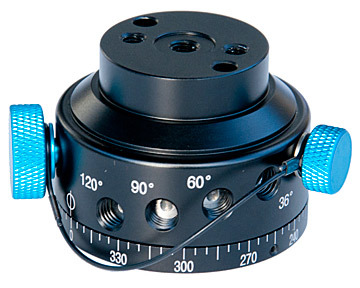 The RD5 Rotator remains a popular choice for users requiring as few as THREE CLICKS (120º increments) when using fish eye lenses of full frame cameras etc. Designed to mount on lower rail systems of current Nodal Ninja R10, R20, R1, RS1/2 using anti-twist sockets and M6 female thread with supplied 1/4 hex screw. Includes your choice of fitting kit (specify below).